Sloths are one of the goofiest animals in the animal kingdom. Their passive faces and leisurely lifestyles make them ripe for jokes, but there has to be a biological explanation as to why sloths are so slow. It comes down to what they eat. Researchers at the University of Wisconsin-Madison set out to explain the sloth lifestyle and what makes it so special. Among other herbivores, and even other vertebrates, the sloth stands out and the research provides some insight into that specialty. 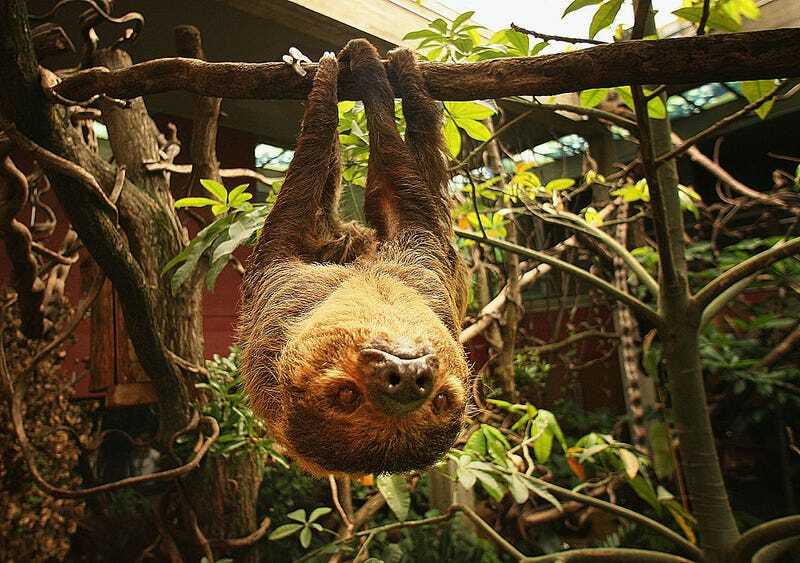 Sloths are categorized as arboreal folivores, meaning these creatures usually hang out in trees eating leaves. Koalas, along with certain types of primate have similar lifestyles, but otherwise, it’s rare. If you think about it, most folivores are large and live on the ground, such as moose and deer. To be able to live in the trees and swing from branch to branch, an animal can’t be large. In a paper set to be published in The American Naturalist, researchers from the Department of Forest and Wildlife Ecology at the university traveled to Costa Rica to measure the energetics—including field metabolic rate (FMR) and body temperature—of two- and three-toed sloths. FMR is generally in direct correlation with body mass. A 2005 study published in the Journal of Experimental Biology measured the FMR of 229 species of terrestrial vertebrates and found that typically, the larger the animal, the higher the energy output. Other factors need to be taken into account as well, such as habitat and foraging habits. The sloth has the lowest FMR of any mammal. Three-toed sloths, for example, expend as little as 460 kilojoules per day, which is the equivalent of around 110 calories. In comparison, a seal can expend up to 52,500 kilojoules per day. Sloths are special in their habitat and diet, so why haven’t more animals evolved to have this low-energy lifestyle? Basically, it’s incredibly difficult to survive on just leaves, which have little nutritional value and don’t provide a satisfying meal. There’s a reason why humans can’t survive on just lettuce. So sloths have evolved. In order to survive on leaves, they expend as little energy as possible. Their metabolisms are slow, their digestive tracks are long, and they move slowly. All to get the most out of their food. “It takes a suite of extraordinary adaptations to survive in forest canopies, and this may help explain the lack of species diversification among arboreal folivores,” Pauli said.